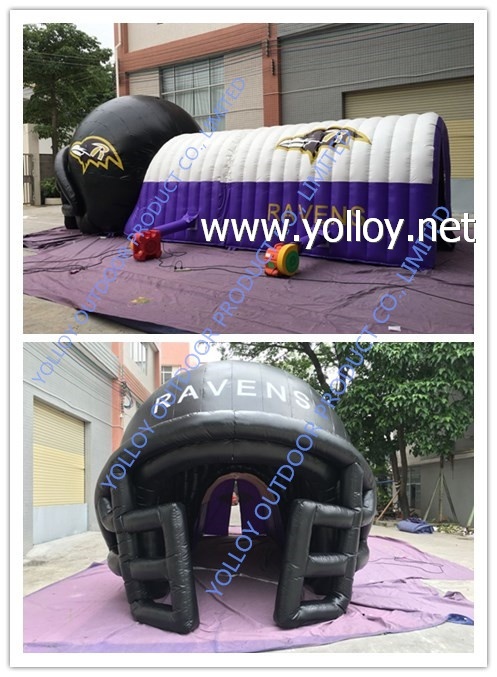 Inflatable tunnels are typically used by professional, college and high school sports teams. An inflatable tunnel or air-inflated tunnel is a tunnel that is inflated by an external cold air inflation fan connected to the tunnel via an inflation tube. Inflatable tunnels are customarily 10' to 30' long when inflated and often attached to inflatable helmets, mascots or team logos. 2)Material:The best of 0.55mm PVC tarpaulin which is fire retardant and water-proof. 5)Reinforced seams with double&triple stitches at every joints. 7)CE/UL blower will be prvided depend on your country. 9)Good quality,service with competitive price will be provided. 10)We also can produce it according to your design,size and color.